Anything making you queasy or sick? Nothing stick out in my mind. Actually, there may be good news on the coffee front. I think I can finally say that I am on a continuous uphill with the nausea battle. I still need to make sure I am eating enough, but for the most part I haven't had any huge "I think I'm going to vomit" emergencies. Hallelujah!!! On Sunday I felt confident enough to order a Pumpkin Spice Latte, and aside from it tasting too sweet (even though I ordered it half sweet) I was able to enjoy the entire thing!! 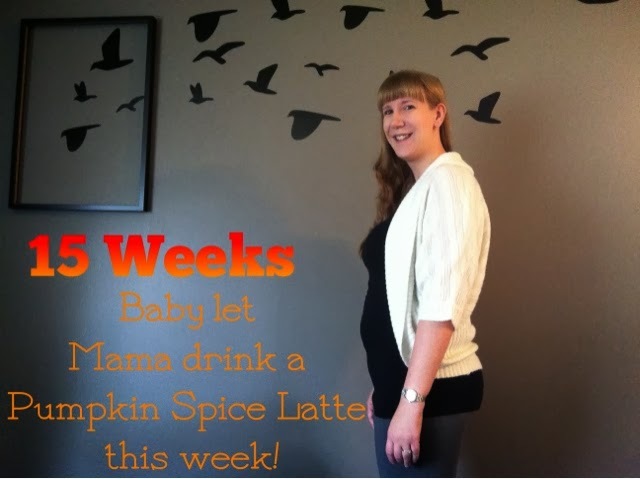 I'm still a bit nervous to try real coffee, but at least I have hope that this aversion might not last the entire pregnancy. Food Cravings? It seems I want a lot of processed foods that I had stopped eating a long time ago... I made spaghetti with meat sauce the other day and needed Kraft Parmesan cheese. I still have a hankering for Kraft Dinner, and I can't get enough fried bologna and egg sandwiches. What the heck baby? Mood? So good now that I feel less sick. Cold is completely gone (only last 5 days! Woo! ), and I think the daily nausea has finally left as well. Also, I get really excited to watch my belly grow, and this past week it feels like it grew a lot!! Woo hoo, keep growing baby!! Symptoms? Steadily growing belly! Also, still getting used to my food intake limits. I hate the feeling of having eaten too much, and it happens a lot quicker these days. I burp so much these days, which for someone who has never really burped much, it feels kind of gross. Sleep? Sleeping great! I'm still able to sleep on my stomach, so that helps a ton. Movement? Nothing. I don't think. Gosh, I don't know anymore. There were a couple times that I wondered if I felt it, but being a first time mom and having no idea what I'm waiting to feel, it's so hard to say. Best moment of the week? This past Sunday was the first in what seems like a long time that I was able to stand for the entire worship set at church. I felt well enough to really focus on Jesus rather than on how dizzy/nauseated/unwell I was. It was so wonderful to be able to experience church fully. Also, my nieces and nephew presented me with a gift for the baby (A cute little rattle toy) It was so precious to have my 6.5 yr old nephew point out to me all the reasons why he thought the toy would be good for the baby. He loves babies. It's the cutest! Looking forward to? Feeling the baby move and knowing for sure! Nursery Progress? No change since last week except that we have acquired more baby stuff that is slowly filling the room! Side note - so thankful for friends that have given us some really great stuff! We also moved a dresser in the room that has been in the garage for the past month or two. The plan is to sand it down and repaint it a fun bright color and use it as the change table. For now.... it waits. Speaking of new baby stuff... I bring to you, a new category! Baby Loot: We got soo much this week! I got a small shipment of cloth diapers in the mail, and I can't get over how cute and perfect they are. I could just stare at one all day in amazement that our baby's bum will fit in there. We also got a swing from some friends this week. In weeks past we've acquired a lot of stuff including a crib, a stroller/car seat combo, a bassinet (borrowed from a friend) a bouncy chair, a bumbo, a diaper bag, and a breast pump. Baby's room is really filling up! Funniest Pregnant Moment of the Week: While I have been feeling a LOT better, I definitely still need to make sure I have food in my belly at all times. Empty stomach = low blood sugar = feeling gross. At this point I kind of expect that to last my entire pregnancy, which I'm ok with because it's way better than the daily nausea I was feeling, and for the most part I am able to stay on top of it.... except for the other day. I woke up hungry, and it was a losing battle the whole day to get enough food in me to keep me feeling well. By the time dinner time came I told Chris I was starved and asked if he could handle dinner so I could go lay down. He did in fact make dinner... except he forgot about the "I'm starved" part and made fairly small portions.... long story short, after dinner we made an entire "second dinner" for me. What can I say? Baby was hungry! Like what you've read? Consider following me on Bloglovin (button below), or you can follow me on Facebook, as well as subscribe by email (Top left of this page) so you never miss a post!